A lintie or linnet is a wee bird in the finch family Fringillidae. It derives its name from its liking for seeds of flax, from which linen is made. 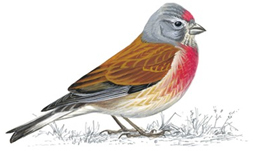 It is a lively little bird, and the word lintie can also refer to a sprightly, merry girl.